These round metal lids fit perfectly over the popular 55 gallon drums seen at many parks, recreation centers, and outdoor facilities. 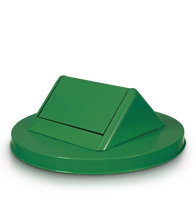 These metal lids can be painted in your choice of green, black or dark blue or can be hot dipped galvanized for corrosion protection and a muted gray appearance. All three lid styles are constructed with 22-gauge steel—the Flat Top Lid is designed with 24"I.D. and features a handle in the center for easy lift-off. 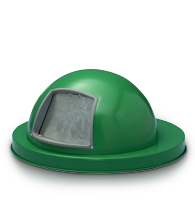 The Swing Top and Dome Top Lids are designed with 23.75"I.D. that fits perfectly on standard 55 gallon drums. 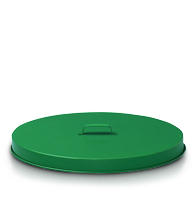 Both offer more protection from unwanted odors, and the doors on the lids prevent animals from tampering with the waste receptacle's contents. 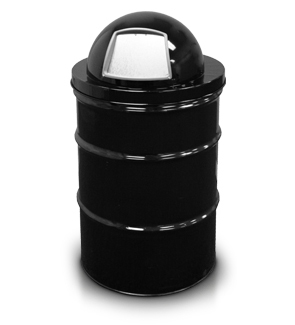 Lids also fit on 48 gallon steel commercial trash cans.